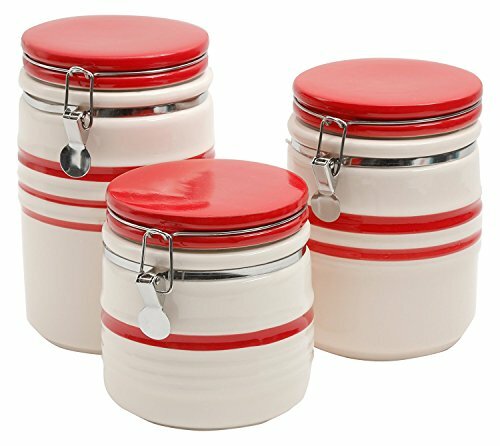 The Gibson Home General Store Hollydale canister set features three linen and red banded durastone canisters sure to bring a unique style to your kitchen. Their unique wire and ball trigger closure keeps foods fresh and airtight for all your pantry needs. These beautiful canisters are perfect for storing snacks, ingredients or other fare while providing a vintage, yet contemporary feel to your kitchen countertop! Each set comes with three 5 inch diameter canisters. The large canister is 8.25 inches high, the medium is 7 inches high and the small is 5.1 inches high. Get your canister set today! Comes in three sizes for a variety of storage needs, from storing ingredients to snacks Spruce up your kitchen with this vintage set!